Mummy, Wife and Chaos: I won! Florence and Fred by Tesco Haul. You may or not be aware that Clothing at Tesco- Florence and Fred- held a 7 days of summer competition. For 7 day's they set a look ie; Florals, Prints, Accessories etc. Winners picked from Twitter, Facebook and What I Wore Today would win a £75 voucher and there is to be a grand prize of £500 win for some lucky fashionista which is open to everyone that entered. 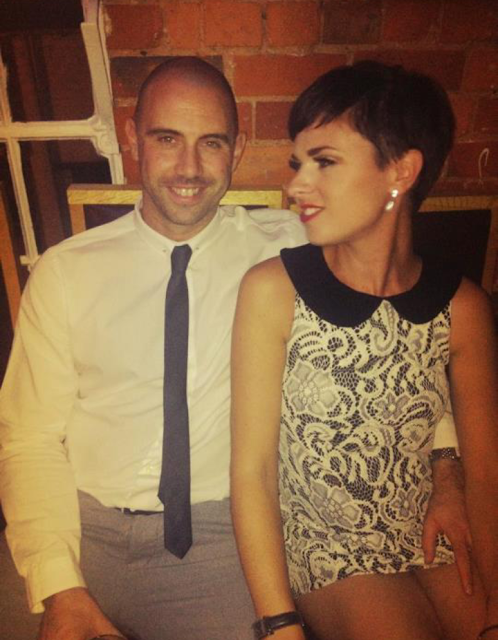 I was super happy to have won the Facebook Sixties look with one of my favourite photo's. So what did I spend my voucher on? As it goes- a lot! 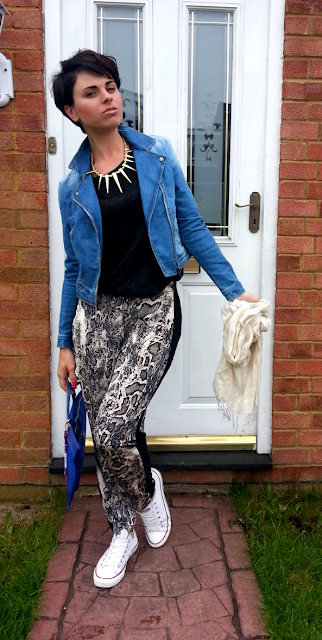 I've been searching for this Denim Biker Jacket for ages so I snapped it up when I found it online! I love it. The picture online doesn't do it justice! 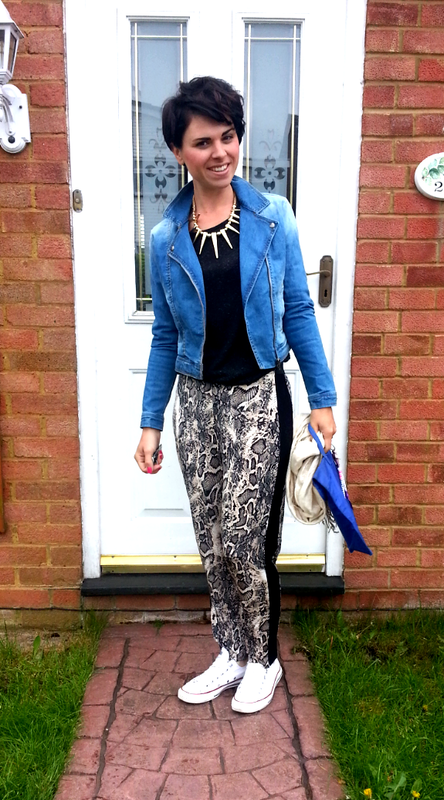 These Snakeskin Trousers are in the sale and true to the reviews they are super comfortable! Top and necklace are Primark. Next up is these two beautiful shoes! Again I have been hunting for some boots just like these to wear with everything but dresses and skirts in particular. The Pink Lace Pumps are adorable and will be great to add a pop of colour to any outfit! 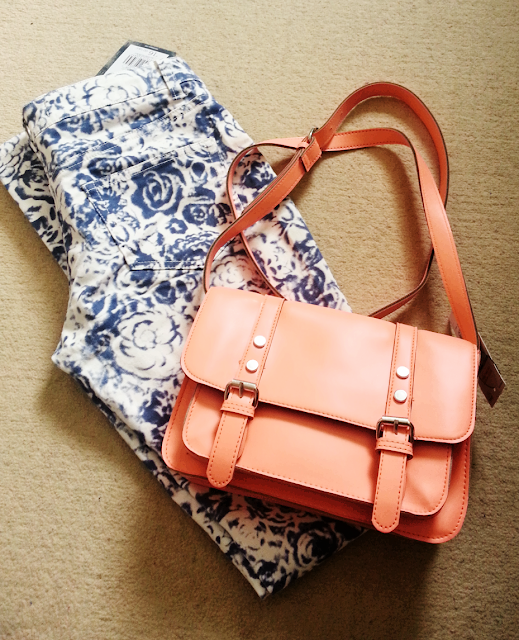 Last up is a bright coloured Satchel perfect for yet more colour and for me chasing the three kids on bikes! The Floral Jeans were first brought to my attention via the lovely Fiona so I took the plunge on these too, they appear more tie dye than Floral but cute all the same! So not bad huh? A happy me! Wondering what my winning photo was? oh wow thank you for the mention! I can't wait to see what they are like on. In Tesco you can get an awful lot for £75! No problems. You sure can! Hi there! What an amazing haul of lovely items and the denim jacket looks gorgeous on! LOVE the jacket - I hold you responsible as I've just nipped over to the Tesco site to order it!